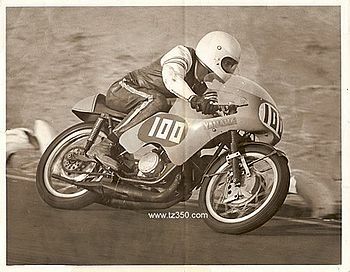 Late in 1962, following the successes of Fumio Itoh, Larry Beale and others over the preceding 10 years of racing development, Yamaha released their first production roadracer, the essentially Yamaha YDS-2 based TD1. 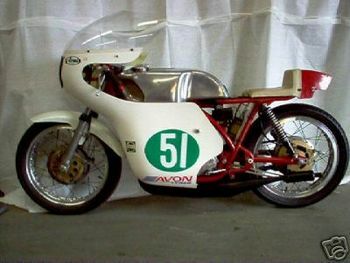 The new bike was relatively easy to put into production since a lot of the components, such as the 27 litre tank, brakes (twin leading shoe drum on the front fitted with a cooling air scoop, single leading shoe on the rear), seat and other running gear were taken from the old RD-48 factory 250cc racer of the previous year, in that the jigs and plans already existed. It had a very similar frame layout to the YDS-2 but was made from lighter material, and had completely different front and rear suspension. The entire front end from top triple clamp to axle was a race special assembly including fork legs, fork tubes, triple clamps, handle bars etc. The swingarm was what appeared to be an approximate copy of the RD-48 unit and was made from a lighter steel than the YDS-2 unit and the rear shocks were entirely different also. 27mm pot-metal carbs, an MC-2RY magneto ignition and 5 speed wide ratio gearbox adorned the machine, along with a cylinder wall lining consisting of anodization of the aluminium cylinder itself. To minimize the risk of seizure the factory had worked out years earlier that it was essential to match the metallurgy of the piston and cylinder so that the required piston/cylinder clearance wasn’t reduced as the motor temperature rose. Very high silicon content was necessary for the pistons and new technology used during casting to control the way the piston behaved as it was made. Legend has it that a handful of customer TD1's came with chrome bores though this is unconfirmed. The clutch was mounted on the end of the crankshaft and was renowned for slippage and usually good for just one fast start anyway. At times the end of the crankshaft, being just 20mm in diameter, holding the clutch would snap right off, with the clutch busting out through the sidecase in a frightening manner !! First gear was very low, which helped with starts, but the huge gap to second meant that first gear was so low it was useless out on the track once the race was underway. This unusual gearing arrangement, combined with very stiff suspension, under-damped forks and "time bomb" clutch made the bikes difficult to ride, though they won races nonetheless. Legend has it that around 60 TD1's were produced, with the vast majority of these going to Australia and the USA. They came from the factory fitted with lights and turn signals, covered the 1/4 mile in 15 seconds, and cost around £500. 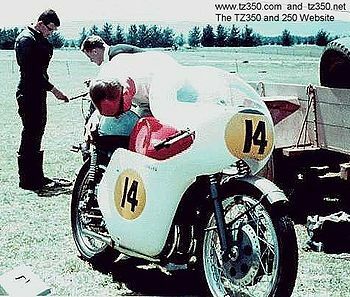 A 255cc version of the TD1, named the TE1 was released at the same time which was essentially the same bike with a 1mm bigger bore. The TD1A was released in 1963. There were a lot more differences between this bike and it's predecessor than most people realise, some of which were: They differ in regards to the frame, forks, triple clamps, steering damper assembly, tacho/fairing bracket, front and rear fenders, expansion chambers, seat, as well as some other minor parts vary from bike to bike. As well, 2nd, 4th and 5th gear ratios were changed. Yamaha manufactured 60 or so of these as well. The 1965 season saw the introduction of the new TD1-B. Yamaha had decided to do away with the sometimes unreliable anodized cylinder, with a porous chrome plating applied to the aluminium cylinders designed to retain oil and assist with engine durability. The entries into the transfers were able to be enlarged thanks to the cylinder bolts being spaced further apart, though their port areas remained the same as the previous model. Exhaust timing was advanced by simply notching the pistons by approximately 2mm, inlet timing was altered by machining 9mm from the rear of the pistons as well. The big and small end bearings were updated also. New exhausts also made an appearance and this, combined with the piston mod, pushed the peak revs up 500 to 10,000rpm. A new, sleeker looking white fuel tank graced the TD1B and the exhausts were now painted black and mounted to the frame using spring loaded brackets, along with this the remote carby bowls were mounted on a special bracket secured directly to the frame's upper tube. Inlet timing saw a major increase as well with the TD1-B, increasing from 70 degrees BTDC to 90 degrees BTDC. The factory also increased the diameter of the crank in it’s weak area to 25mm, eliminating the breakage problem. The TD1-B began to win a lot more races than it’s predecessor, with the increased reliability as much as performance improvement to thank for this. Engine mounts cracked, clutches were fragile and the chrome cylinder lining would flake off snagging rings, but the little problems such as these were worth it, these bikes won races against much bigger, well established European machines. The TD1-C was released in 1967. The addition of an inlet “boost finger” machined into the cylinder lining, up either side of the inlet port, as well as corresponding windows cut into the piston to facilitate this porting mod, thinner piston rings, as well as deepening the inlet port and updating the exhausts, took the power output up to almost 40bhp. In addition, the wet clutch was moved to the now traditional position of on the end of the transmission output shaft and had 3 extra plates added. The huge gap between 1st and 2nd gear was brought back to a more usable size. 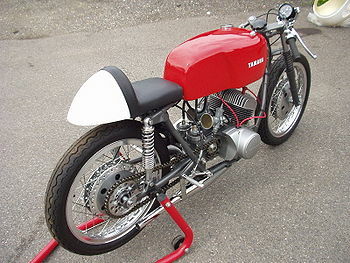 1969 was the year when the factory released the new Yamaha TD2 (250cc) and Yamaha TR2 (350cc). One of the main targets of the development team was to ensure that as many parts as possible were interchangeable between the two capacity machines to reduce production costs, as well as encourage wider use of the relatively versatile bikes. This page was last edited on 9 February 2011, at 01:46.